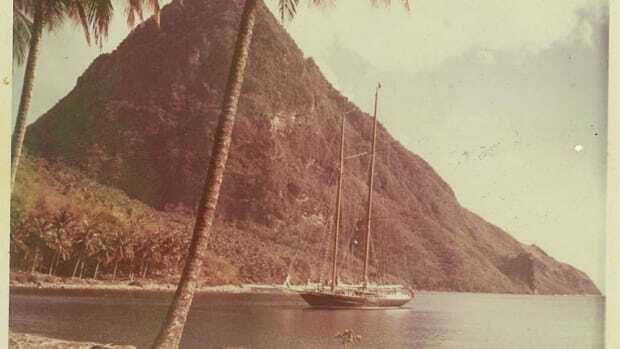 Growing up in Marigot Bay, St. Lucia, during the 1960s was an adventure. A few youngsters lived in the village overlooking the bay, and we befriended them. Lewis Dalawas was my age, and he loved to fish and explore as much as I did. 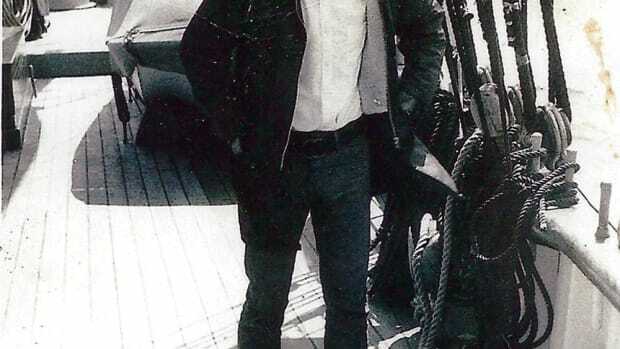 He often sailed with my brothers and me on Peggy, the 25-foot wooden sloop my father gave us one Christmas. 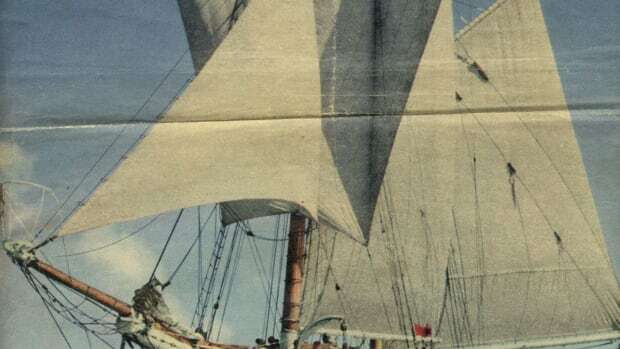 She was red-hulled, with a simple gaff-rigged main and one jib. A small, oblong cockpit seated four, and a sliding hatch led to the cabin. 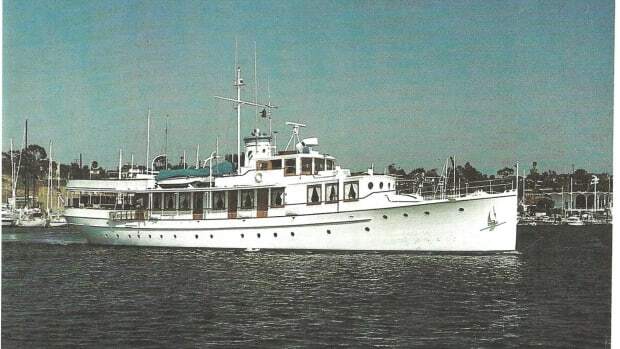 Peggy was Spartan below deck — just the hull frames and a bench to port and starboard. Nonetheless, she sailed very well, and we thought her the best. Had my parents known where some of our voyages took us, they might have keeled over. We frequently made overnight trips to the bays and coves along the coast and usually held firm to the destinations our father had plotted for us. 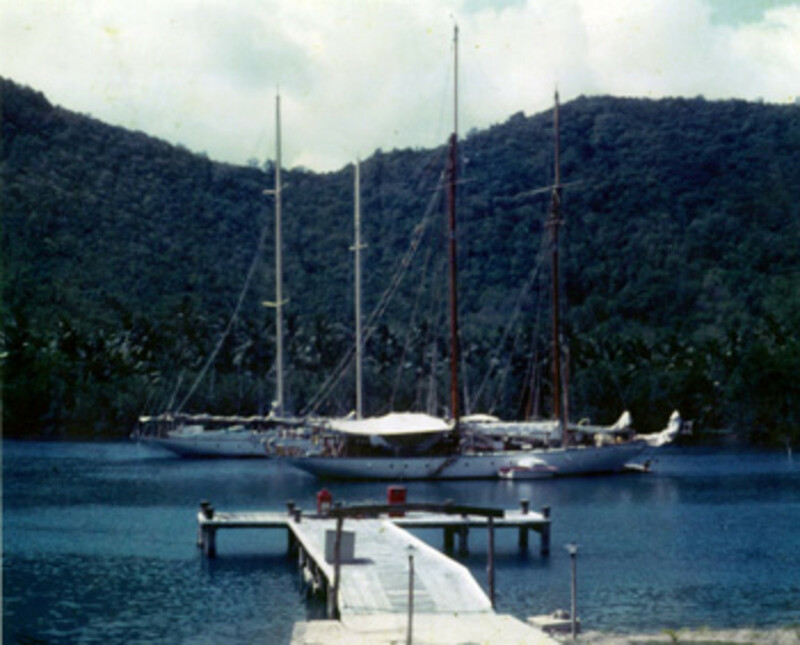 One summer’s day when I was 14, we planned an overnight voyage to Pigeon Island at the north end of St. Lucia. 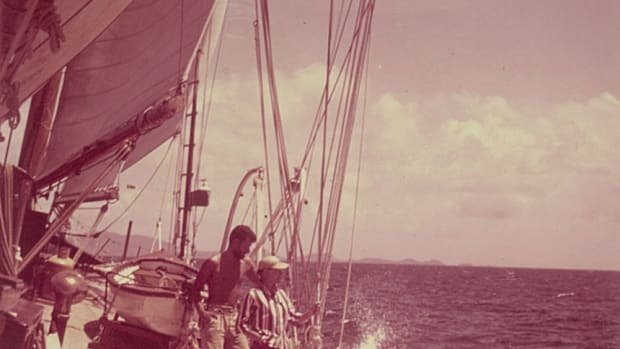 With my brother Peter as mate and Lewis as deckhand, we stocked Peggy with a container of fried chicken, bread and water, and set off on yet another exploit. It was a fine day; a blue trade-wind sky hung overhead, filled with puffy white clouds. 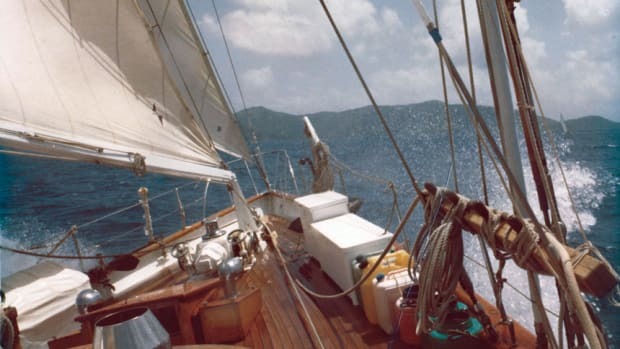 The easterly breeze tossed spray over the bow as we laid a course northward from Marigot Bay. Our little sloop danced merrily over the waves, dipping her lee rail occasionally. 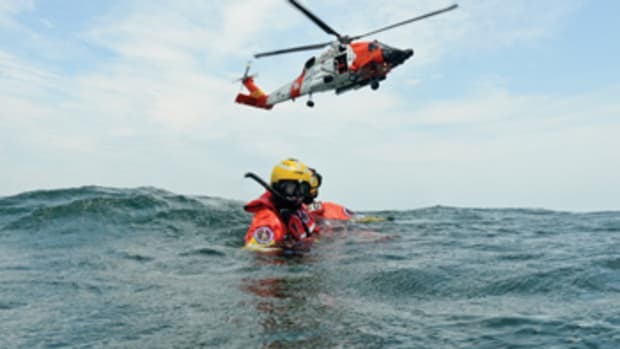 Before we knew it, we were miles offshore and well past the point that Dad had instructed was a safe limit. As I looked to the north, the island of Martinique and Diamond Rock suddenly seemed very close. “Pete,” I said excitedly, “let’s go to Diamond Rock.” My brother looked at me with uncertainty. 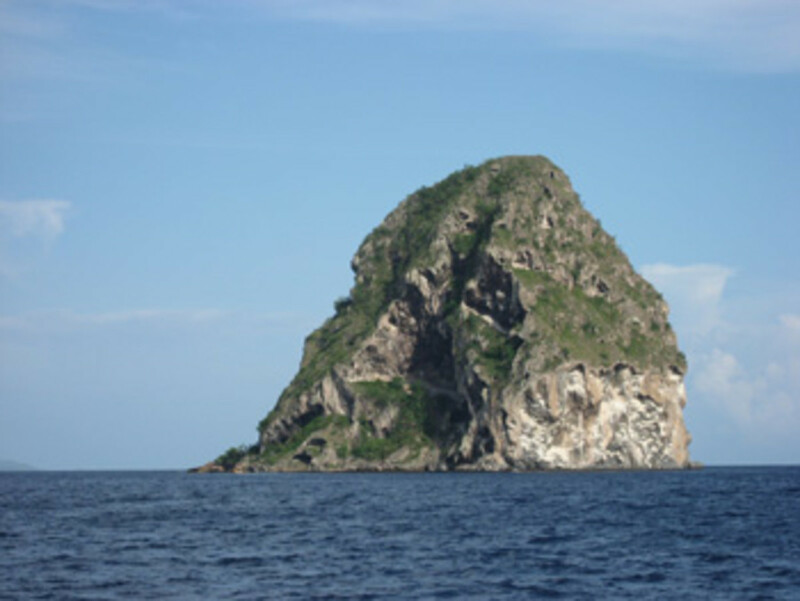 The Rock was some 19 miles from St. Lucia and most definitely was out of our bounds. “Do you think it’ll be OK?” he asked, although the tone of his voice told me he already knew the answer. “Yes man, come on, we’ll be there real quick today,” I said. I was surprised when he agreed. Usually I was the only one tagged for hatching schemes, and being the oldest I usually got in trouble for “knowing better.” Lewis, on the other hand, had no qualms about voicing his uncertainty. His superstitions about the open sea ran deep. “De deeper de wata, de more dangerous it is,” he said. Pete and I outvoted him, and in any case, he was outranked. We closed the distance rapidly, and before long, Diamond Rock was closer to us than the big French island. The formidable citadel rose precipitously from the sea, growing in size as our little ship approached. Stone cliffs dotted with black-mouthed caves appeared, and jagged precipices overhung the sea. Suddenly I felt a stinging sense of uncertainty. Pete and I had seen Diamond Rock from the deck of our father’s schooner many times, but now it was different. Alone, our confidence waned. Massive rocks ascended from the dark blue depths to only a few feet below the surface, reaching toward our keel. “That’s a big rock, man,” Pete said with a deep exhale. Years ago, when the British and French were fighting over the islands, a terrible thing happened here. The main port for French warships making landfall in Martinique is just around the corner in Fort-de-France. The British admirals thought that if they could keep the French ships from sailing close along the shore, as they approached from the east they would have to stand offshore, ending up far to the leeward of Fort-de-France. The great frigates were square-rigged and didn’t sail into the wind very well. They could lose days tacking back up into Fort-de-France. The British decided to put cannons on Diamond Rock to keep the French warships offshore. 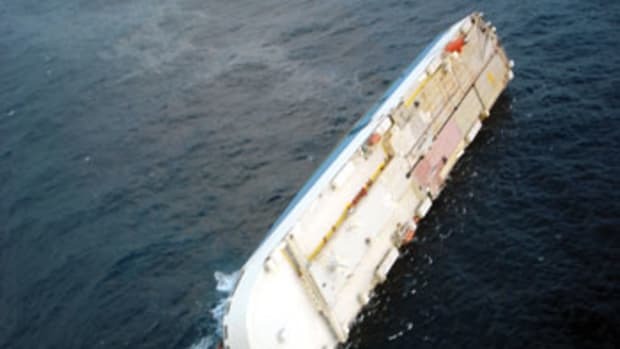 It was one of history’s great feats of seamanship and engineering. The British sailed one of their frigates up to the rock, moored her there and hoisted the heavy cannons to the top. They built a rain catchment with cistern and fortifications, and quarters for the men to live. When it was all done the British put a garrison of their soldiers ashore and called the fort HMS Diamond Rock. At first the plan worked well; whenever a French ship tried to sail in under the coast toward the harbor of Fort-de-France, it was driven offshore by the British guns. But the British success was short-lived. The French had been busy, too, and they brought bigger guns to bear from the hills of Martinique, preventing the British frigates from supplying their soldiers on Diamond Rock. Time passed, and drought prevailed. Food was scarce on the rock, and the fair-skinned Brits suffered terribly in the heat. They slowly succumbed to thirst and starvation, yet the Union Jack continued to wave from the heights of the rock. The British still call it HMS Diamond Rock, and to this day when Her Majesty’s warships pass by, they dip their flag in a salute to the men who perished there. As I thought about my father’s story, Pete came up with a plan to moor Peggy, suggesting we drop anchor and take a line ashore at the base of the rock. 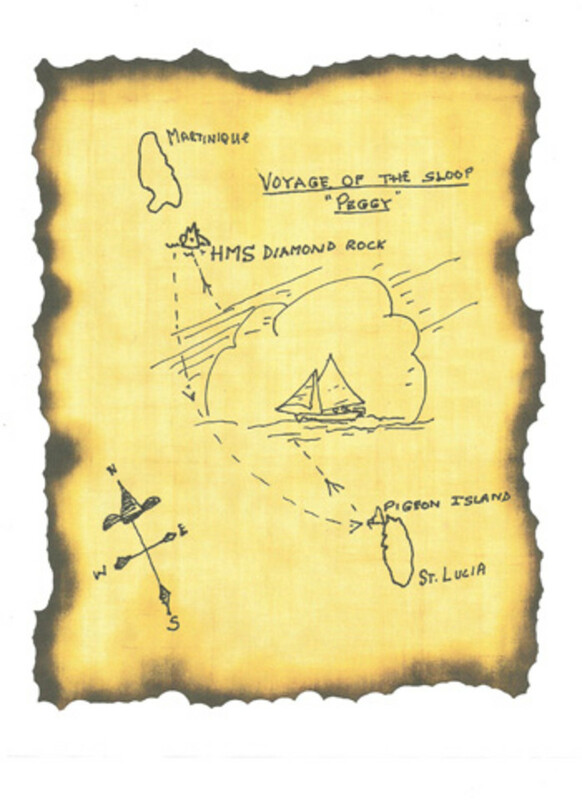 We dropped the jib and sailed our sloop to a point in the calmest lee of HMS Diamond Rock. Pete dropped the main, and Lewis pitched the little Danforth anchor overboard. As we furled the sails, the eerie silence was almost haunting. The immensity of the rock, if not our tryst, now fully dawned upon me. After a few moments, Lewis gave a big snort and dove in. He swam ashore and climbed onto a small stone ledge at the water’s edge. It looked as though it had been carved in the rock on purpose, perhaps for use as a landing point. Lewis tied the line around an outcrop of stone, and we hauled our stern in close. Pete and I went ashore, as well, but no amount of talking would keep Lewis on the rock. He scrambled back aboard Peggy the first chance he got and positioned himself firmly in the hatchway, where he nibbled on a chicken drumstick, watching us from a safe distance. If he was about to die at the hands of some sort of devil on the rock, he wasn’t going without eating some of Ma Boudreau’s chicken. He was bending over a bush on the side of the path. I stooped beside him, and we brushed away the dry sand from a long piece of rusted metal. “It’s a gun, man!” he shouted, picking up the barrel of an old musket. As he shook away the years of sand, I marveled that his treasure was being held in the hands of a living being for the first time in more than a century. I tried to imagine who had been the last and how he had died. Holding it out as if to fire it, Pete sighted along the barrel. The wood had long since gone, but at that moment it was real enough to us. We found many treasures that day. Brass sword hilts with heavily rusted steel blades, and pistol barrels with the flintlock firing mechanisms. There were white leather straps from uniforms preserved by the dry sand and hot sun. We collected dozens of musket balls and a few cannonballs. There were scores of these, but because of their weight we could not carry many. I found brass buttons from officers’ tunics and a long-stemmed white clay pipe. I felt a strange sensation as I stood there in the ramparts of HMS Diamond Rock, with a rusty pistol in one hand and the remnants of a sword. There were, indeed, ghosts here. The story of the place echoed in my ears, and as I closed my eyes, I could hear my father’s voice: They all died, you know. There was no way to help them or get water to them. I saw the soldiers in their red tunics with white straps standing in the sun. They stood bravely, facing the north toward Martinique, their muskets leveled. Peter shook me out of my daydream. From where we stood, our sloop looked like a tiny red dot on the water next to the base of the cliff. The sun was halfway down the sky, and Lewis was waving from the safety of the hatch. It was time to go. We scampered down the rocky pathway to the landing. Lewis met us there and was worried about the things we had brought down from the heights. “No man, these are neat. Look here,” I said, brandishing a sword hilt. Lewis cowered as if he had seen a ghost. We cast off and set the main before getting the anchor up. It wasn’t long before we were on our way, Peggy heeling to the easterly breeze, bound for the peaks of Pigeon Island, which we could see some 20 miles distant. Much during the day had been new to us, and another new experience was soon to come. Although we had done a lot of sailing, we always planned to be anchored at night. As the last rays of light died to the west, we felt very alone on the greatness of the sea. It would be dark soon, and we were far from land. Peggy had no compass or lights, and Lewis had eaten all the chicken. Pete and I sat in the cockpit and ate bread, washed down with water from the plastic container; it tasted surprisingly good. Pete steered, and as the completeness of tropical darkness fell upon us, the stars came out in their millions, dotting the sky in an impossible array of splendor. We soon saw the glow of Castries, the capital of St. Lucia, and steered our course accordingly. Pete and I talked through the night, with the stars as our guide. We talked about the fish, the birds and the sea. We wondered about the massif, which had disappeared in the darkness astern of us so many hours past. The men, the living and the dying. As we talked, we held the old bits of sword and pistol in our hands. The trade winds blew gently, and two young boys spoke of great things. We anchored Peggy at Pigeon Island as the sun rose. The wind had turned light during the night, and our little sloop had glided slowly across the Martinique channel. We slept the day, except for Lewis, who had slept the night. He had been terrified of sea spirits and would not come on deck. The only sign of his presence had been the occasional noise coming from the cabin as his body dealt with the consequences of eating more than a dozen pieces of chicken. We said we had found the artifacts on the other side of Pigeon Island. Our father and mother accepted this, but not without some doubt. Mama Boudreau’s Mango Chutney Ingredients 6 cups sugar 4 cups vinegar 12 cups mangoes (peeled and sliced) 3 cups seedless raisins 1 chili pepper (seeded and finely chopped) 1/4 cup finely chopped ginger root 1 large onion 1 teaspoon crushed garlic 1 teaspoon salt In a large pot, combine the sugar and vinegar and boil for five minutes. Add the mangoes (they should be just a little green), raisins, chili pepper, gingerroot, onion, garlic and salt. Cook for one hour, stirring frequently until thick. Pack in hot, sterilized jars and seal. Makes about two quarts.